This is so far out of my comfort zone I need a GPS to find my way around. Seriously, Kryolan is a professional and stage makeup brand, so while I've heard about their products quite a bit, I never encountered them until I was sent Kryolan High Gloss as part of a promotional Glossybox (a monthly subscription box of assorted beauty products). The color that arrived, Toffee, is not exactly something I'd choose on my own: it's a warm beige with just a hint of an almost-pink. You can see below that it's rosier than the Naked Princess lip gloss in Barely Naked. Kryolan High Gloss is actually almost as opaque as a liquid lipstick. It's all pigment, thus giving a full coverage. Th gloss is thick and I prefer to apply it with a regular lip brush instead of the built-in brush applicator, because it gives me a more precise and polished look. 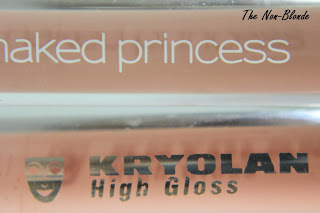 This Kryolan gloss is not sticky and has a light fruity scent. It's comfortable enough to wear, though I find that my lips need to be well-moisturized as it's just like any highly pigmented lip product. 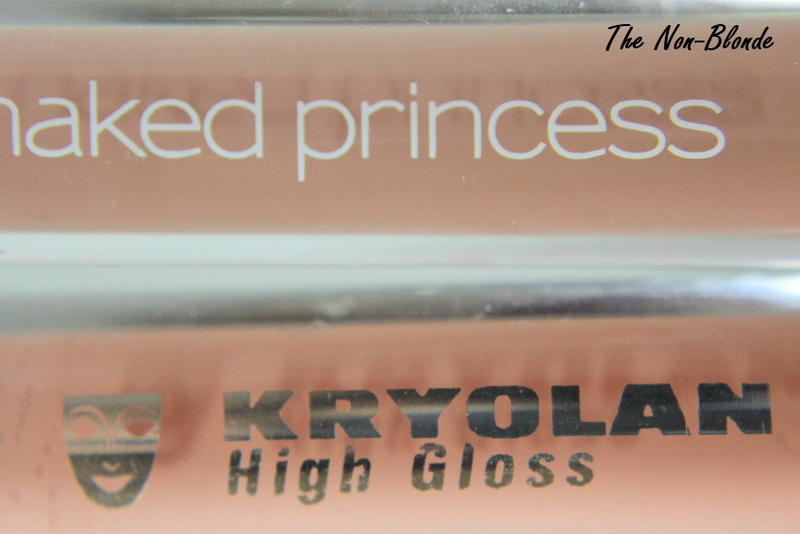 The color of Kryolan Toffee High Gloss is rather flat (no complexity) and has a glossy cream finish. I have to mix in a little extra red or plum color because Toffee is too beige for my lips and face. It can be used as is to conceal the natural pigment of one's lips, but I look horrendous with beige lips that are about 8 shades lighter than my naked lips. My preferred "naked" color from Kryolan range would probably be Butterfly. 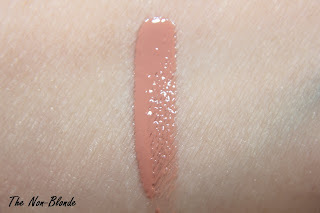 I might have to go and search for it, because I am impressed with the quality and wear of the gloss, even if Toffee is not my friend. Kryolan High Gloss (around $18) can be found in stage makeup stores and online from danceshopper.com. The product reviewed here was sent to me free of charge as part of a Glossybox preview. I actually got my first Kryolan product in the October 2011 Glossybox (I live in Spain so that may explain why I got it back then!) 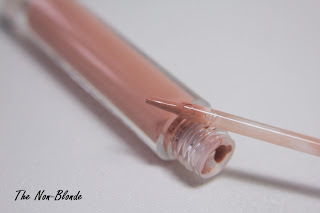 and it was also this gloss but in Candy Pink color. 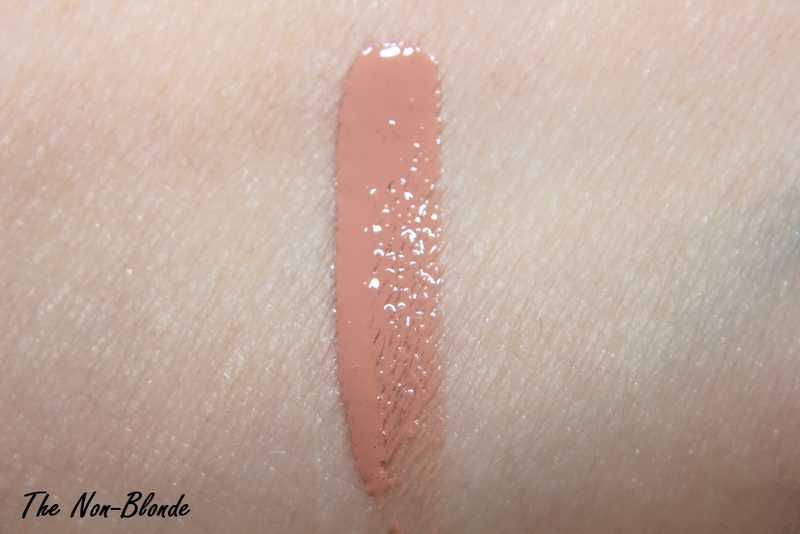 I was quite impressed because I found it long wearing (3-4 hours, at least more than I expected), quite moisturizing, nicely pigmented and not sticky. I agree with you, it's worth exploring in other colors too. If you can, check Kryolan's range of professional concealers, specially the salmon, green and "mandarin" shades - they really work.